Lofts In The 'Lou: Cherry on Top! As a life long St Louisan, I've spent more time in a given week driving on Kingshighway Boulevard than I've spent at the Arch in my lifetime. Despite the seeming disparity, the relevance that the Gateway Arch has on our collective lives is important to consider. Especially important now. Starting on Tuesday, the top 5 design teams in the international competition to re-create the Gateway Arch grounds will be unveiled at the Gateway Arch. This display will be open through September 30th, with a traveling display to be available through September 26th. A winner should be selected on September 24th. My hope is that most St Louisans will consider it part of their civic duty to participate in the competition by stopping by the displays and getting informed about what we could be left with. Obviously the architects, and dignitaries will be there. What ultimately becomes of the Arch Grounds will have more of an impact on our City and its ability to attract tourists, conventions, and even new jobs and residents; its important for ALL St Louisans to be there and be in the know about our options. 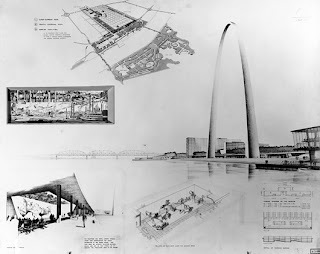 Had that been the case when Eero Saarinen's design won the 1947 Design Competition, it's feasible that more of his design would have been implemented; a design that included much than the current Jefferson National Expansion Memorial. I'm trying to decide now what I'm going to do. The unveiling will be Tuesday at 9am. It will undoubtedly be a feel good event with the Mayor and all the City Folk in attendance, but on Friday at 7pm, there is a 100th Birthday for Eero Saarinen with presentations from historians, architects involved with the last contest, Saarinen's daughter and others. Being there to hear the inspirational statements from the Mayor would be nice, but the possible commentary on the new designs by persons involved with the earlier design could really be powerful. Who knows, I might show up twice. Either way, the amount of effort I'm seeing from the NPS and others shows me that its important for us to weigh in and talk to others about what could potentially be a major impact on our towns future.